My daughter attended her first prom this weekend. She decided she wanted a yellow dress, which proved to be tricky, but she found one she loved. She set out to buy flat shoes to go with it, but instead fell under the spell of a pair of heels that make her tower over me by about half a foot. She borrowed some jewelry from me, which only left her needing some sort of bag to hold her phone, lipstick and car keys. That’s where I jumped in. Codi falls into the category of women who carry a purse only when it’s necessary. I’m there with her. But as long as you have to, it might as well be cute. And as small as possible. I apologize for the photos. I was in a hurry and didn’t realize the fabric made it a little difficult to see my stitching. Hopefully you can make out all the important parts. On the larger outer piece, measure 1 1/4” from the long edge and 2 7/8” from each edge. Iron a small piece of interfacing to the back and stitch a 1/2” vertical button hole on each side. Cut the buttonholes open. Fold the narrow outer strip, right sides together and stitch the long edge. Turn. 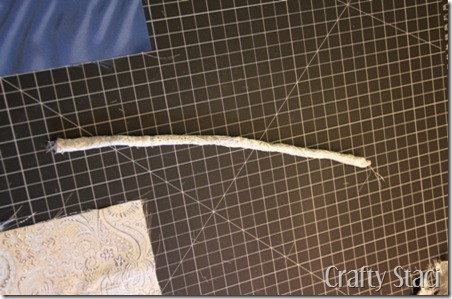 Cut a piece of narrow elastic 2” longer than your wrist. Attach a safety pin to one end and feed it through the tube you just made. When the opposite end is even with the end of the tube, stitch through both to hold it. Continue until the end with the pin is even with the other end, remove the pin and stitch that end as well. This is the wrist strap. Lay on top of the large outer piece so the ends are even with the short edge on one side. The top edge of the strap should be even with the top of the buttonhole. Fold the other side of the outer piece over the top, short edges even. Stitch down short edge, backstitching over strap. Stitch a couple of rows of long basting stitches near the bottom edge of the bag. Pull the stitches to gather and knot the thread. Flatten the bottom of the bag with the seam centered on top. Stitch across 5/8” from the bottom edge. Stitch the lining the same way, leaving out the wrist strap and leaving a 2” opening in the side seam for turning. Turn the lining right side out. Put it inside the outer bag. Match seams and raw edges. Stitch around the top edge. Turn right side out through the opening in lining. Hand stitch the opening closed. Push the lining inside the bag, folding the outer bag to the inside 1/2”. Sew a row of stitching 1/2” from the top edge, where the bag and lining meet, and another 1/2” below that. Your buttonholes should be centered between. Cut two pieces of ribbon, 20” each. Feed a piece of ribbon into one buttonhole, all the way around the purse, and back out through the same hole. Repeat on the other side. String a bead on both sides and knot the ribbon below it. We found it needed to be double-knotted to keep our bead on. Trim away excess ribbon. Pull both sides to close. This was the perfect prom accessory for her and looked great with her dress. I think I might need a more rugged version of this to hold my stuff at track meets!